Munax’s egg products are ready to use foodstuff for professional usage. 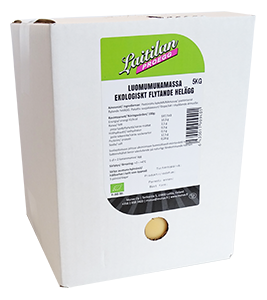 The usage of our versatile egg products reduces waste and space requirements and improves the hygiene and safety of food production. Choose Munax liquid whole eggs, egg whites, yolks and scrambled mixes—to save time, prep and serve. Trust Munax for your egg solutions. Let us take care of your exact menuing needs and help you run a safe and smart kitchen. Pasteurized Munax egg products are made in clean manufacturing facilities and strict control, which improves the effiency of the kitchen with hygienic and convenient packaging. The special advantage of egg products compared to individual shell eggs is their risk-free nature. The products have been heat treated and are therefore salmonella free. Image: Munax’s egg products are produced under close scrutiny. First shell eggs are broken in the breach machine. After that, the yolk remains in the cup and light shaking allows the white drip into the lower part of the strap. In this picture, Anne is supervising, that everything goes like planned. The egg yolk and egg white are transporting to own lines. The product is pasteurized. We produce either egg white, egg yolk or liquid whole egg. Prior – Ready to use FROZEN heart wafer. We can also make small amounts of special products, that customers like. Our selection also includes organic products.